As mammals, rats belong to a class of animals for which a wide range of emotions and virtues have been scientifically documented. Denying emotional feelings to rats is representative of science’s ultra-conservative tendency to deny feelings to nonhuman animals whenever there is the slightest shadow of doubt. And there will always be a shadow of doubt, because feelings are ultimately private. Thus, the glass-half-empty ethos of denial allows humankind to maintain the insidious old crutch of human supremacy. Another manifestation of this glass-half-emptiness runs rampant in pop-culture portrayals of wild nature. Tune in to any of a wide range of televised nature documentaries and you’re likely to find a steady stream of the struggle for life—red-in-tooth-and-claw, kill-or-be-killed fare aimed at TV nature producers’ primary target demographic: males in their twenties. Drama sells, and peaceful coexistence is generally deemed unsalable by producers. Don’t buy it; it’s a deceit. For every rare predatory event in nature, there are countless acts of mutualism. In the exquisite workings of natural ecosystems, competition bows to cooperation, give-and-take to give-and-give, selfishness to considerateness, spite to altruism. 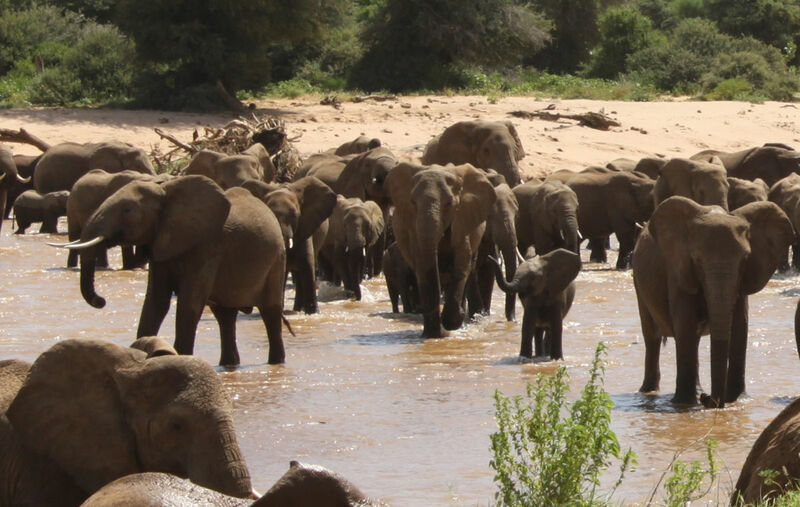 I experienced the true balance of nature recently on an 8-day safari tour of Kenya. I spent cumulatively more than 40 hours exploring several of this country’s famous national parks. Many of the animals—including hippos, elephants, giraffes, lions, and cape buffalos—were notably more charismatic than those I typically see in the woods behind my home. But the tenor of their lives was reminiscent. At Samburu National Park I watched a bull elephant tugging and swishing grass from just the other side of the perimeter fence surrounding the hotel compound. I could hear his rhythmic breathing. A family of vervet monkeys foraged peacefully in the grass, nibbling at grass stems and other bits of vegetation. A few of them sauntered across our little deck. Three others had a brief rolling romp on the grass. Amorous coos and chortles emanated from the tops of doum palms and other trees throughout the day. A nearly constant chatter rose from the white-browed sparrow-weavers who nest there. I awoke one morning to the mirthful, rather manic babbling of green wood-hoopoes, which recalled a 1985 visit to Kruger Park, South Africa. At the pool, I scooped insects from the water — in this case mostly small wasps — and watched the persistent ember of life rekindle before they flew off. We saw the aftermath of one scene of carnage. Three fresh and only slightly eaten wildebeest carcasses lay next to the road. These wildebeest had clearly fallen victim to an ambush from a large and well-organized lion pride, and we could see one female a little off in the bush feeding on something. Eliud, our Kenyan driver and guide, said there is a pride of about 15 lions here, and that when prey are plentiful they will often kill more than they can eat, leaving most of the carcass untouched. The belly of one victim was torn open, revealing a large mass of partially digested grass. Fifty meters away lay a stomach, glistening pink in the morning sunlight like a bloated jellyfish. A third wildebeest had only some meat taken from the hindquarters, and one eye gnawed from its socket. I need no motivation to remain vegan, but if I did, this would be strong medicine. How should we feel about these three victims of a violent death in a lion’s jaws? Does their demise earn a few points for the glass-half-empty crowd? I don’t think so. Each of these beasts was a healthy-looking adult. I’m guessing they weren’t singled out because they were starving or injured. Indeed, virtually all the wild animals we saw in Kenya looked in the prime of health. Rather the dead trio probably just had the misfortune of being the nearest ones to the ambushing lions. So let’s do some simple math. Let’s conservatively say that each of the victims had lived 3-5 years. Death by lion takes about as many minutes. That’s about half a million minutes of mostly good wildebeest living for every minute of terrifying, painful death. That isn’t even a glass-half-full. It’s practically overflowing. The balance is kept by the high numbers of wildebeests. The pride had about 15 lions, but the wildbeest were probably in the hundreds. It’s an ecosystem that worked just fine for who knows how many thousands of years.